Other users logged into a system may loose work if another user shuts down/reboots a system. Data loss is not a Good Thing. - The warning message should be "Other users are currently logged in to this computer, shutting down now will also close these other sessions"
The org.freedesktop.login1.power-off-multiple-sessions policy is granted by default for local users on the current session. That's currently intended, I think it's generally a good thing on a desktop. However, it should indeed warn you about it, that's the gnome-session part. 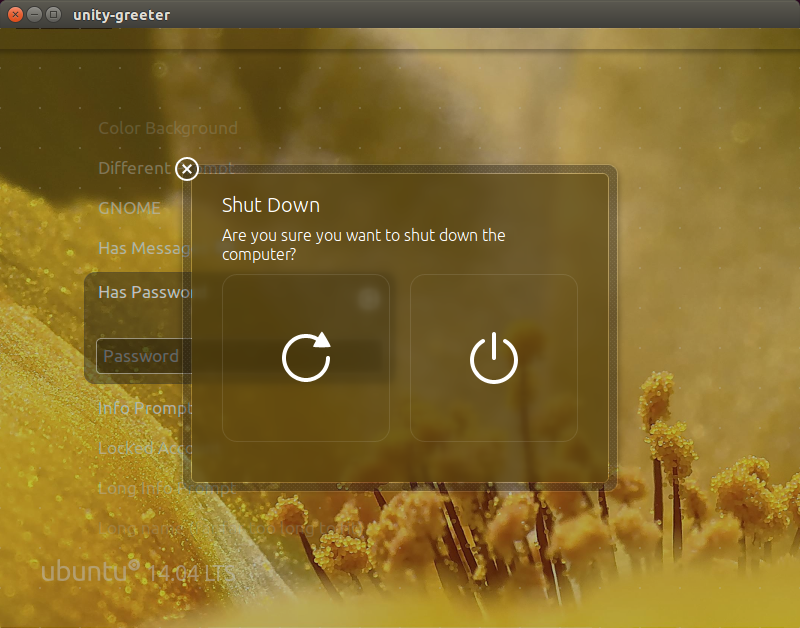 gnome-session just triggers the shell (unity or unity-greeter) to show the shutdown dialog. 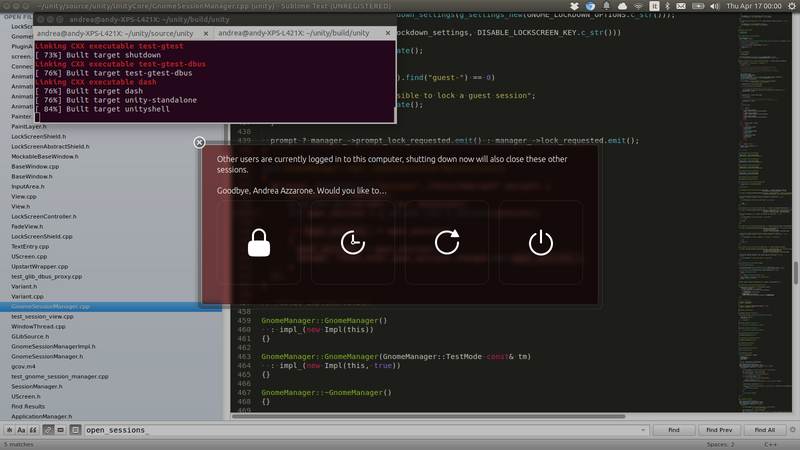 So I think this has to be solved in those two places not gnome-session. We need a design for how to integrate this into the existing dialogs. You can easily find out if there are existing sessions by interrogating logind. The session indicator is what's actually used to start the restart/shutdown process. It already tracks the current login sessions (via logind) and either instigates the shutdown dialog via Unity or uses Zenity to display an alternative shutdown dialog. It needs to modify its Zenity dialog and add additional information (userlist?) when sending its request to Unity, and Unity needs to be modified to handle that data,. The issue is the interface is from GNOME and doesn't support additional information to be passed. So we either need to extend/replace it or just do the checking in the dialog. lp:~robert-ancell/unity-greeter/shutdown-session-warning contains a proposed solution for this in the greeter. Screenshots to follow. Note I used the LightDM session interface to check if sessions are open. logind keeps sessions around after logout (due to pulseaudio staying alive?) so this leads to a misleading warning. This now effects the new lock screen too. - Add option to hide certain users until alt+ctrl+shift is pressed. - Drop some fixes that are in Vala 0.22 now. "Other users are currently logged in to this computer, shutting down now will also close these other sessions" is a run-on sentence. I've reported bug 1310970 about fixing the grammar and other problems in the text. One issue with doing a SRU there is the new strings that are going to be displayed in english/non translated in other locales. The version in trusty-proposed works as per "Desired resolution". The user is warned about other users being logged in and that those other sessions will also be closed. The warning (1st sentence) is not localized into ... at least french. The warning is shown when another user is logged in graphically (via lightdm). But what about when the other user is logged in a virtual console (Alt+F1) or via SSH, RDP, etc? From what I've seen, the warning isn't shown in these cases.